Oral fluid drug screening provides a reliable preliminary result and is ideal for use as a secondary screening tool in many programs. These tests are non-invasive and may be used to determine recent drug use (as early as 5-10 minutes). As with any rapid POCT screening test, presumptive positive results must be confirmed by a laboratory to be forensically defensible in court. Spectrum MDX specializes in rapid diagnostics, bringing the latest in screening products to our clients. We are committed to offering comprehensive solutions for quick & accurate detection of substance abuse drugs in any setting. We strive to help our customers enhance patient treatment with solutions that optimize screening programs. Why Use Oral Fluid Drug Testing? Oral fluid testing can be a very convenient method of screening as it offers a simple, non-invasive collection procedure. This test may be administered with no limitations and without the need for specialized collection facilities. Many workplace sites are incorporating oral fluid testing into existing screening programs for post-accident and reasonable suspicion situations, as drugs may be detected in a short window with no possibility of adulteration. Rehabilitation centres are now also incorporating this method of screening to determine recent drug use and concentration ranges in patients. The use of this screening tool will optimize screening programs to help execute better health outcomes. 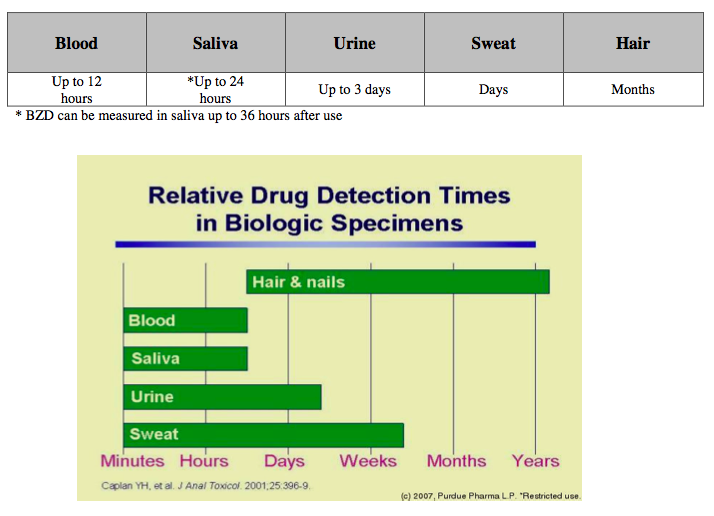 The table below outlines drug detection times for various matrices including saliva (oral fluid). Most drugs may be measured in saliva drug testing up to 24 hours, compared with urine which is a much longer period of time. The Statswab® Oral fluid screening device is a rapid one-step screening device for the simultaneous, qualitative detection of multiple drugs and drug metabolites in human saliva. This fully integrated test offers results in minutes and can screen up to 12 analytes including some common drug compounds such as Marijuana, Cocaine, Opiates, Amphetamine, Methamphetamine, Ecstasy, Benzodiazepine, Buprenorphine & Oxycodone. This product is Health Canada licensed. With over 20 years of industry experience, Spectrum MDX is a reputable and reliable partner for your screening requirements. We offer comprehensive solutions to suit all screening programs. For more information about our oral fluid drug screening products, please contact us today.